Scientists have understood that microbial fuel cells (MFC) can generate electricity from urine and other forms of waste for a while now. But new research shows that the process can also kill bacteria and a new approach to sewage could be the result. The researchers imagine a self-sustaining system that would be of huge benefit to the developing world. The team at the University of the West of England has published its results in the well-regarded journal PLOS ONE. Lead researcher Professor Ioannis Ieropoulos said in a statement that this is the first time that MFCs have been shown to be capable of destroying pathogens. “It shows we have a stable biological system in which we can treat waste, generate electricity and stop harmful organisms making it through to the sewerage network,” he says. Urine has increasingly been of interest to scientists as a way to generate electricity because hydrogen can be extracted from it using far less energy than is required to do the same with water. Microbes inside the fuel cell break down organic matter in the waste and convert it into electricity. The same team has previously used the MFC to generate enough electricity to power a mobile phone and they’ve shown that it can clean urine to the point of being safe to dispose of in the environment. 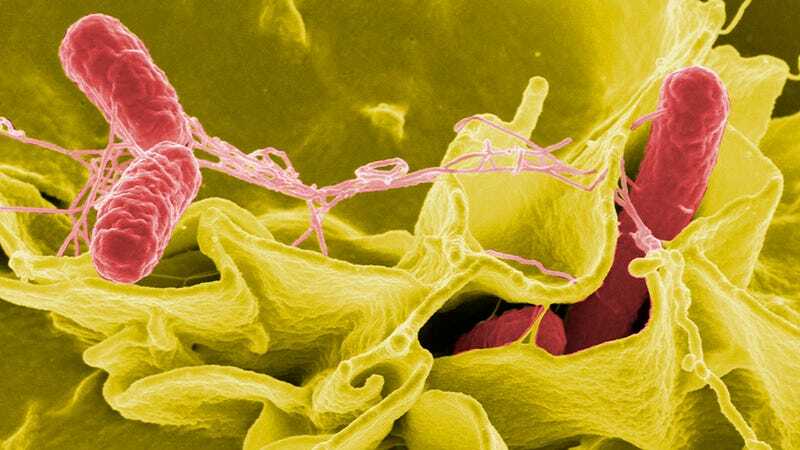 The new discovery is that the same process was able to reduce the levels of Salmonella enteritidis that was introduced to a urine sample. Pathogen numbers were reduced by two-thirds and were below the minimum expectations of the sanitation industry. Though the researchers weren’t able to eliminate the pathogenic organisms completely, they intend to keep working towards that goal. New tests will be performed on other pathogens, including viruses. This research was funded by the Bill and Melinda Gates Foundation and the intention is to apply it to that group’s work in developing countries. Professor Ieropoulos says that “water companies are under pressure to improve treatment and produce cleaner and cleaner water at the end of the process. This means costs are rising, energy consumption levels are high and powerful chemicals are being used.” He hopes to see the MFC system installed in homes and that it will reduce demands on wastewater processing plants. Obviously, this could also have environmental benefits as well. According to the EPA, “drinking water and wastewater systems account for approximately 3–4 percent of energy use in the United States, resulting in the emissions of more than 45 million tons of GHGs annually.” If the tech can be scaled up and perfected, there could be major reductions in our energy usage.